After reading the hands of two renowned movie directors (Steven Spielberg and Alejandro Jodorowsky) one expected a similar level of creative talent from the hand of Quentin Tarantino, the director who directed Reservoir Dogs and Kill Bill. From this point of view his hand is disappointing. His hand does not match the hype associated with his name. However it makes up in other ways. enough when compared to the Greats. It shows a clever man, with an excellent ability to express himself in an artistic way (shape and length of Mercury finger, and phalanges) as well as intelligence, concentration and imagination (Head Line, Mount of Moon). His hand also shows a high level of sensitivity to the environment and the ability to absorb from it (sensitive pads) which could perhaps help him in his creative work. Seeing good hand photos of famous people is not so common and I was lucky with Tarantino as I was able to see the Head Line clearly. His Head Line is indeed striking, and shows not just intelligence, mental capacity and imagination, but also his extremely ambitious nature and the ability to lead others. This is probably why he chose to become a director rather than an actor. He has acting talent has well, but as a director he could put his leadership skills to good use. Tarantino was ambitious from a very young age and also started thinking for himself early. These personality characteristics invariably bring success as they show focus and concentration. Tarantino's hand shows that he has a rather bold, outspoken kind of personality, evident not just from the start of his Head and Life Lines but also from his thumb. The thumb and Mount of Venus also shows a generous, compassionate and independent nature. Even though his hand does not show a superior creative imagination, it shows an independent mindset. People like him are free-spirited souls who search for freedom and independence. His hand also shows a manipulative, controlling and shrewd nature. Shrewdness which could border on wiliness (shape of Mercury and Jupiter fingers). This feature of his character is a developed one, as it is visible on his right hand only (his right hand shows his current thinking as he writes with this hand). He is very critical of others and there is a tendency towards jealousy (shape of the Saturn finger, shape of the Mount of Moon and the Saturn phalanges). His hand also shows idealism and an unwillingness to compromise (Jupiter finger). His speech would tend to reflect this. There are indications that around the age of sixty he starts to become more reclusive (Mount of Venus, Life Line). The reason is not difficult to surmise. People like him tend to become disillusioned with the world. The highly critical attitude combined with idealism and strong independence and self-reliance would result in this. Related Reading: Read the hand analysis of actors from Hollywood, or perhaps Bollywood. I had always wanted to ask this - how much is idealism important for a person to succeed? I have noticed that as age progresses, one tends to get less and less ideal. Is this wrong? Should we not lose focus on idealism? Ah - but you see his films are just like him. A bit on the wild side. So there is a genius in operation but it is his own unique style. So lets not compare him to others - each his own place. And then all what you say is good for a director. DI, idealism is great if you are a religious leader or spiritual leader or godman but it will surely lead to disaster if you are a businessman. Depends on the profession. So I guess people shed it along the way because they want worldly success. In any case it depends how much idealism. Anonymous, I guess you are right, why compare? And yeah its true he is quite unique and his independence and boldness gives him that certain wildness. What about a politician ? :) There was one politician who was an idealist - Jayaprakash Narayan , do you know any politician who was an idealist? I guess some politicians are idealists, for example Mahatma Gandhi was one. hey., do you face reading? if you take that into account Quentine tarinto has a long jawline which represents fierce determination. wud love to here your thoughts on that. Mr. Curious, I do not do face reading. I have no knowledge of it. do u read astrolical profiles. quentine is an aries which makes him a born leader. and his tarus moon sign makes him bull headed. i think thats why he was able to be such an influential and independant film maker., a cut abouve the rest. Mr. 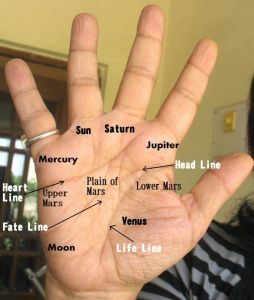 Curious, I do not believe that any sign (whether astrological or on the palm) makes things happen. That is my firm belief. I believe it is the other way around. It is the way we are that makes the lines on our hands and that is why the lines and even shape of the fingers can change. We make our lives and rule our destiny. I still do not get if fate line from wrist to the middle finger makes you rich or not. Is line of sun necessary for being rich and wealthy? Cause Ambani doesn't have a good line of fate but is very rich. How?? No, it does not. And neither is the line of sun necessary for being rich. The lines of fate and sun are very relative to oneself, and how one perceives self. A successful taxi driver can have as good a fate line as any rich industrialist. About Ambani's hand I cannot comment because I have not been able to study his hand. In any case no "line" or "sign" makes you rich. It's your own hard work and ability and other personality characteristics and also circumstances. What about birth? If you're born in a rich family, you're automatically rich, unless of course you decide you don't want to be. Don't you think that that will be reflecting in a person's hand? This case falls into the "circumstances" category if I understand your latest reply correctly. Don't you think that circumstances are shown in one's hand? Like if you look at the hand of the Queen of England, there will be signs of her being rich *just* because of her birth? The hand shows the inside of the mind. It reflects your own reality, not that of society. If a cab driver thinks he is rich and the Queen thinks she does not have enough, the driver's hand will show more satisfaction with the money. The actual amount of money is not shown, just your feelings towards it. Hi Nita! I was wondering if you could do a hand analysis of David Lynch. he is a famous and visionary director in independent cinema. He is well-known for his artistic direction, which diverged into many different mediums, as well as for his distinct style and voice, much influenced by surrealism and dream perception. Dust Runner, Unfortunately one photograph is not enough as one cannot make out the hand and finger shape accurately. Usually I work from at least a dozen photos and in addition I need a photograph to confirm whether he writes with his left hand or his right. David Lynch seems to be a fascinating character and I will add add him to my to do list and try to find more photos of his hands. Thanks, Nita! Unfortunately, this the only one I could find so far. I will keep searching.